You have to wonder exactly what the guys at Kaneko USA were thinking when they began work on Socks the Cat Rocks The Hill, a 16-bit platformer featuring Bill Clinton's moggie. 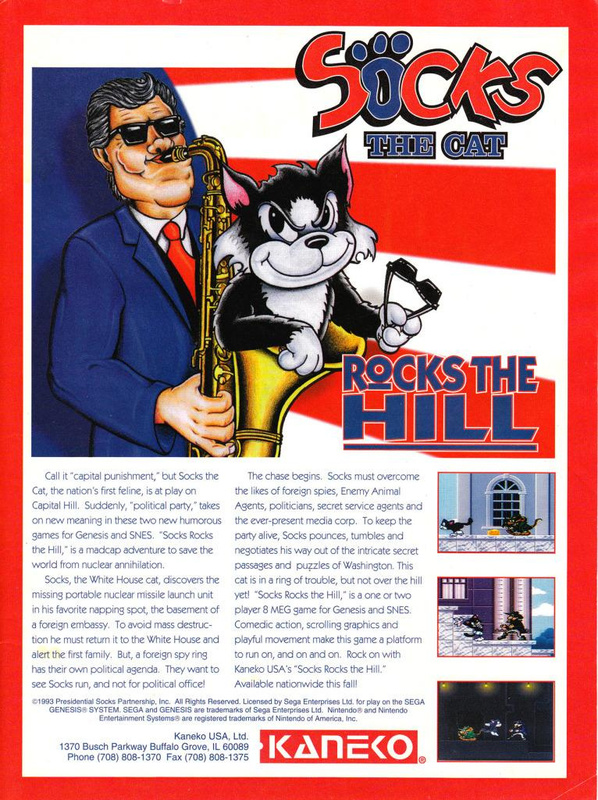 Boasting a risible plot which involves Socks saving the world from nuclear destruction and featuring bosses based on caricatures of former Republican leaders such as Richard Nixon and George H. W. Bush, Socks the Cat Rocks The Hill (which was in development for both the SNES and Sega Genesis / Mega Drive) was always going to be on shaky ground - especially when you consider that Nintendo had policies in place which prevented titles with "subliminal political messages" or "overt political statements" from corrupting the minds of its young audience. Yet it wasn't censorship issues which prevented its launch. Kaneko USA got as far as producing print advertisements - like the one shown below - and finalising the ROM, but the office was closed before the game could hit its proposed 1993 release date. Nothing has been seen or heard since - until now, that is. An individual called Tom Curtin has found a functioning prototype and has also acquired the trademark, giving him the right to publish it legally. He's taking to Kickstarter to release the game, with the intention of creating a "proper" physical SNES version - complete with packaging and manual - for around $50, while digital copies will be around $20 to $30. Curtin has also stated that the top backer will get the prototype itself - which, he says, cost him as much as a "decent used car" to acquire. 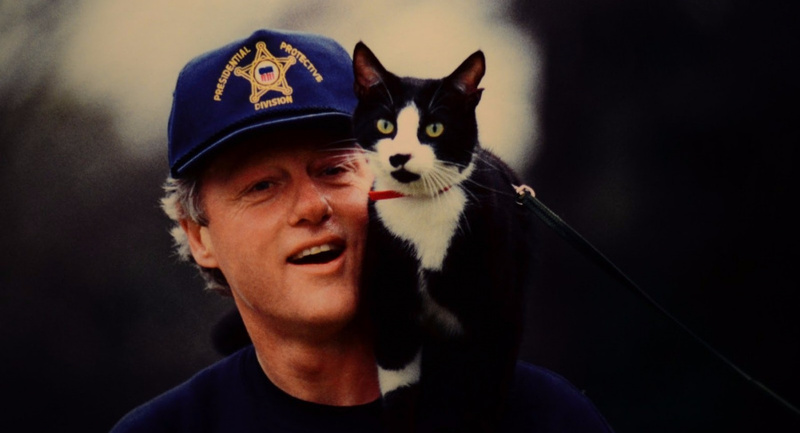 An adopted stray, the real-life Socks lived in the White House during the early years of the Clinton administration and was regularly photographed with the president. He reached the grand old age of 19, passing away in 2009 after a short battle with cancer. Will you be pledging your support to this forthcoming campaign? Let us know by voting in the comments section below. This was never actually released? I remember reading a review (of the Mega Drive version, I think) in something like EGM or GamePro. Either someone made it up, or finished copies made it out! i remember seeing that ad way back when, but i think it was a gameboy game? wow, memories playing tricks on me now. i do remember that this is election season in the states and one of the candidates has the last name clinton. must just be a coincidence. Man, people will really get a Kickstarter going for anything these days, huh? I had this on my to get list after EGM wrote about it, I also wanted the SNES Popeye game made by the Kunio Ken developers. @deKay Review copies are different from retail. I'm guessing these were recalled and destroyed after review? If the Kickstarter fails, maybe Piko Interactive will buy it? @Damo Oh, I know that - but there must exist (or must have existed) finished copies if the game was actually reviewed! @deKay Often review copies weren't actually finished games - they came on special carts. I know because I've got a review copy of Cybernator which was sent to a UK magazine (and used for review) yet it has all the anime cut-scenes included - these were removed from the "final" release. This was a very common practice back in the '90s - not all games changed after review but the carts themselves weren't "retail" editions and were wiped after being returned to the publisher so they could be re-used. Final really means retail in this case. The game was clearly finished, just never released. I remember seeing advertisements or something in old gaming magazines, but that was it. There were many games that were advertised back in the day, that never saw the light of day...many due to companies going out of business. I'd love to see it released, but not for that high of a price, but I'd also love to see some of the other classics from the 8-16 bit era re-released...(A Nightmare On Elm Street, The Goonies 2, Fester's Quest, Yo Noid, Mic And Mac, Global Gladiators, Ballz, Clay Fighters, Wizards And Warriors, Low G Man, Atyanax, Chip And Dale's Rescue Rangers, Sub-Terrania, Pro AM...yeah, I could go on). I really wish they would change the main character to just a cat that has nothing whatsoever to do with Bill (or Hillary) Clinton. A concept so stupid it's fantastic. The use of kickstarter to release games from their collector-imposed ransom however is a pretty grimy tactic. Really? You didn't make the game, it's not your intellectual property, and you have the hardware to dump it so just release the ROM image for preservation's sake. @Shikinouta The guy paid a lot to get the prototype and also has the copyright / licence for the title - so why wouldn't he try to make money from it? He's offering to create physical copies as well, which costs money. I'm not sure what part of this is "grimy", given that he's trying to publish the game properly. Huh? I didn't know it went unreleased. Those ads were prevalent in EGM and Gamepro at the time. Before seeing the ad, I didn't know Clinton played the sax or had a cat. They were quite informative. @Damo Whoops, I brushed over the part about him legally acquiring the rights (read it at 7:00, give me a little slack) and just assumed he bought the prototype off of eBay and was asking for money to make up for it. Well, It's a fair deal to ask for money to help with the cost in retrospect, I suppose I'm just a little to critical when I wake up! I'm just worried about Kickstarter abuse, after the Coleco Chameleon I'm understandably a bit wary. ...What? Maybe some things are best left unreleased. @Shikinouta There have been some real stinkers on Kickstarter, that's for sure! @Damo It still sounds pretty slimy, in a Martin Shkreli sort of way. Covering costs is one thing, but making a profit is something else in this case. If the kickstarter fails, is he just going to take his ball and go home? Even if the kickstarter succeeds, with charging for digital copies (what, is he going to license an emulator? ), it doesn't sound like he's going to take kindly to the ROM being made publicly available. Also, when dealing with reselling not only someone else's IP, but one featuring the likeness of at least one former president, I certainly hope this guy's spending some of that kickstarter money on a decent lawyer, and that this article oversimplified things when it said he just had "the trademark" to the game. This sounds great. I look forward to the kickstarter, lol. I really want a new SNES game complete in box in the modern age. The game sounds interesting, but a "legal" release sounds dubious. Since it features Bill Clinton and distinct likenesses of other presidents, doesn't that mean the game needs the rights to those images? I think that's a little extra legal work then simply "I own the trademark." Rereleased sports games need an license update if it is still going to include actual team names, player names, and their likeness. Say everything is legit, say it gets funded, I don't know how much luck he'll have putting a SNES game on the eshop for $20, when I see so many people complain about the prices for 1st party games, Earthbound especially. @technotreegrass not really no, political figures don't really have the right of publicity (a sub genre of the right to privacy) - and if they do it's very weak. It's very different to the whole legal regime of franchised sports. Also, this is clearly a parody, which is exempt. So yeah no problem. it is true though that a "trademark" is not enough - I don't know what he purchased but he needs all the intellectual property rights, not just a trademark. This actually isn't the only time people have done something special with Socks. He was an alien White House spy for the MiB in an episode of "Men in Black: The Animated Series." That was a pretty good show, although it negated a couple important plot points from the end of the movie and was then completely exiled from canon once the sequels came out. (MiB2 is trash, but MiB3 is pretty good; just remember that K was deneuralized and rejoined MiB as J's partner in the 2nd one before skipping straight to the 3rd one.) In hindsight, it also didn't help that the series finale involved aliens destroying U.N. Headquarters and the Washington Monument (as a precursor to a full-scale invasion) only a few months before the real life terrorist attacks of 9/11. @dumedum That's good to hear. I'm tired of reading about Kickstarter games who realize that they didn't do their research and get screwed after people fund them. This seems more suited for the genesis, yet, i guess they only wanna finish it for the snes, oh well. @deKay I totally thought it had actually been released, too. @TruenoGT That's not sad, it just means that you're old. Which means that I'm old, too, because how could anyone approximately the same age as me possibly forget Socks?? WOW! I remember the mag add for this. Forget which magazine it was. I do remember reading the review in the Grand Union reading isle while my mom went shopping, then asking for POG's. I feel like it will become a bidding war for the top backer and the only remaining cart of the game. For SNES collectors, this is huge. The chance to own what is possibly the ONLY original copy of a game never released.